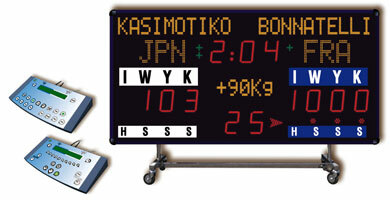 Multi-functional Tabletop Scoreboard scores Wrestling, Jiu-jitsu, Grappling, Basketball, Volleyball, and more. 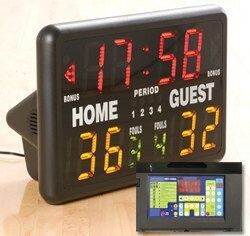 Use as a metronome, stopwatch, clock with alarm and program timer. Clock counts up or down from 99:99. 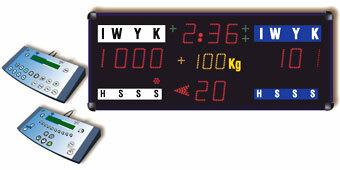 Scores to 199. Period, bonus, and possession indicator. Built-in control panel. 3/4" for the letter "bonus" all LED. 1-3/4" for the letter "HOME" and "GUEST"
Power voltage as 110v. 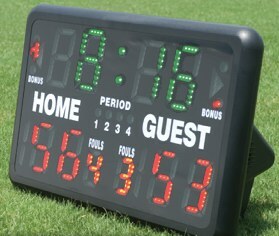 Size: 24" x 16" x 10", Weight: 13 lbs.